When I got home yesterday from work, I had a nice little treat on my door step . . . a box from Papertrey Ink. I couldn't wait to dig into it but Hayden had other plans! We have had a solid week of cold weather and rain here in Houston . . . translation . . . no outside time all week at school for the kiddos! Needless to say by Friday, Hayden was bouncing off the walls! I put him to bed around 8 thinking I would get a little play time in for myself. Wrong! What was I thinking, right? Finally around 11 he passed out but by then, I was too tired to do anything and passed out myself. So, here I am playing with my new goodies tonight! While out shopping today, I picked up a few boxes of Necco Sweethearts. My favorite! I started tinkering around with a box idea and came up with this. The instructions (or constructions as Hayden tells me) are here . . . Download pull_box.pdf. 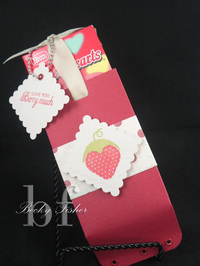 I used bazzill cardstock, My Punny Valentine from Papertrey, Nestabilities, eyeletts and a ball chain to tie off the tag. 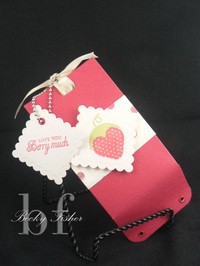 The printed cardstock is from the Maybe Baby colletion from Daisyd's.